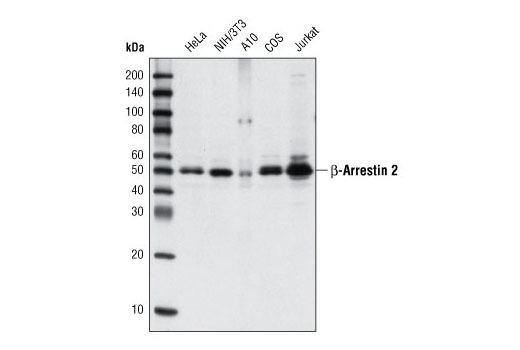 Western blot analysis of extracts from various cell lines using β-Arrestin 2 (C16D9) Rabbit mAb. 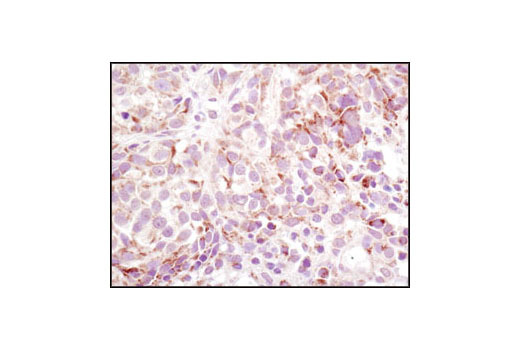 Immunohistochemical analysis of paraffin-embedded human melanoma using β-Arrestin 2 (C16D9) Rabbit mAb. Substrate: Vector® NovaRED™ (Vector Laboratories). Prepare Vector® NovaRED™ per manufacturer's recommendations. Apply 100-400 µl substrate to each section and monitor closely. 1-10 minutes generally provides an acceptable staining intensity. β-Arrestin 2 (C16D9) Rabbit mAb detects endogenous levels of total β-arrestin 2 protein. It does not recognize transfected human β-arrestin 1. Monoclonal antibody is produced by immunizing animals with recombinant human β-arrestin 2. Arrestin proteins function as negative regulators of G protein-coupled receptor (GPCR) signaling. Cognate ligand binding stimulates GPCR phosphorylation, which is followed by binding of arrestin to the phosphorylated GPCR and the eventual internalization of the receptor and desensitization of GPCR signaling (1). Four distinct mammalian arrestin proteins are known. Arrestin 1 (also known as S-arrestin) and arrestin 4 (X-arrestin) are localized to retinal rods and cones, respectively. Arrestin 2 (also known as β-arrestin 1) and arrestin 3 (β-arrestin 2) are ubiquitously expressed and bind to most GPCRs (2). β-arrestins function as adaptor and scaffold proteins and play important roles in other processes, such as recruiting c-Src family proteins to GPCRs in Erk activation pathways (3,4). β-arrestins are also involved in some receptor tyrosine kinase signaling pathways (5-8). Additional evidence suggests that β-arrestins translocate to the nucleus and help regulate transcription by binding transcriptional cofactors (9,10). Shenoy, S.K. and Lefkowitz, R.J. (2005) Sci STKE 2005, cm10. Lefkowitz, R.J. and Shenoy, S.K. (2005) Science 308, 512-7. Luttrell, L.M. et al. (1999) Science 283, 655-61. Luttrell, L.M. et al. (1999) Curr Opin Cell Biol 11, 177-83. Luttrell, L.M. and Lefkowitz, R.J. (2002) J Cell Sci 115, 455-65. Waters, C. et al. (2004) Semin Cell Dev Biol 15, 309-23. Lefkowitz, R.J. and Whalen, E.J. (2004) Curr Opin Cell Biol 16, 162-8. Waters, C.M. et al. (2005) Cell Signal 17, 263-77. Kang, J. et al. (2005) Cell 123, 833-47. Ma, L. and Pei, G. (2007) J Cell Sci 120, 213-8. U.S. Patent No. 7,429,487, foreign equivalents, and child patents deriving therefrom.